WOW it's almost June?! Where has May gone?! I will tell you... two weddings, 8 days in Disney, a baby turning one and the list goes on! So here I sit, ready to confess a few things that have been on my mind. 1. I am so glamorous my fresh white t from this morning is now sporting both a drop of salad dressing and a drop of infant ibuprofen. It's not enough to change the shirt...my standards have become so low! 2. Why ibuprofen you ask? Sweet Max had to get all his one year old shots today. He was a champ! I think his leg chub helped soften the blow. 3. It's a miracle, I weighed myself after Disney beause I was assured after all the yumminess I consumed I would have gained...but I didn't! Woohoo...now to keep it off at home is another matter entirely. 4. Do any of you other moms find yourself in the trap of staying up too late at night just because you finally have peace?! I keep finding myself up late to read or even work around the house or do photo work because it's finally peaceful. I have been starting to remind myself though that a tired mommy in the morning won't be a nice to her kiddos so I need to go to bed for them and just start over again in the morning! 5. Disney already feels like years ago...my best advice if you are ever considering it - wait til about 5 or 6. We were able to do it with three little ones because we had so much help but Matt & I could have NEVER taken our little ones ourselves. You just need so many hands. I recommend 5 or 6 because they are fully potty trained, can stand in line a bit, don't need to take a nap and are tall enough for most rides. We certainly had fun and made precious memories! I will definitely try to share some pictures via facebook but haven't had much time to sift through the over 400 pics I took! 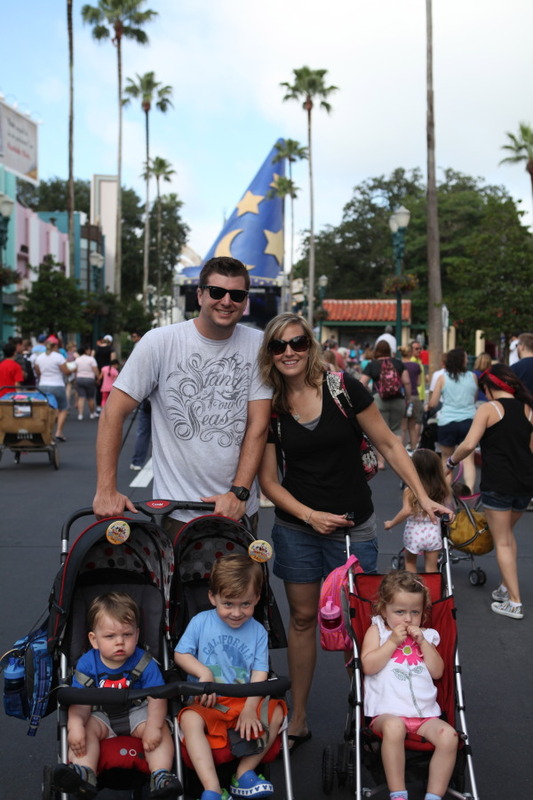 Here's one of the family in Hollywood Studios..
Well I hear crying...what a crazy day we have had, the life of a mommy. Will post later about Max's first birthday! Hope you friends have a great week!